This download is a free demo version, which can be upgraded to the full version, by buying and entering a license code. There is no separate download for the full version. Mac OS X 10.6 or later. 2 GB RAM recomended. Full 64 bit support. 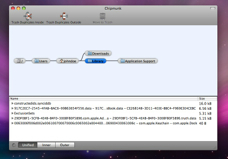 Chipmunk 1.5.4 also runs on Mac OS 10.5 Leopard. It has no PowerPC support. Chipmunk 1.2 also runs on Mac OS 10.4 Tiger but has no 64 Bit support.